October 27, 2011- ISKCON Bangalore- The Govardhana hill is worshiped on this day to commemorate the pastime of the Lord Krishna lifting the Govardhana Hill on His little finger, in order to protect the residents of Vrindavan from torrential rains sent by demigod Indra. The Supreme Personality of Godhead performed this pastime as a seven year old boy in order to crush the pride of Indra, the Lord of the heavens. The Govardhana Hill is actually very dear to the Lord. On this day a replica of the Govardhana Hill is made out of cooked rice and other edible items in the temples. This replica of the Govardhana Hill is generally known as ‘annakoota’. Huge quantities of food are prepared in this ceremony and are very sumptuously distributed. At Srila Prabhupada's ISKCON Bangalore, Lord Krishna was decorated in Giridhari alankara, holding Govardhana Hill on the little finger of His left hand. Devotees worshiped a hill made of 100% vegetarian cake weighing about 800 kgs! Devotees at the temple made an exact replica of the original Govardhana Hill. This cake was baked at the temple’s bakery and was made of different flavours and topped with cookies of various kinds. The Govardhana cake was offered to the Sri Sri Krishna Balarama Deities. Then the Govardhana Puja pastime was narrated to the devotees. After this an arati was performed for Krishna Balarama accompanied with the singing of the song – Jaya Radhe Jaya Krishna Jaya Vrindavan – which describes Lord Krishna’s various pastimes in Vrindavana. At the end of the ceremony the cake was distributed as prasadam to all those who are present. On account of Deepavali there was grand fire work display for the pleasure of their Lordships Sri Sri Radha Krishna-chadra. 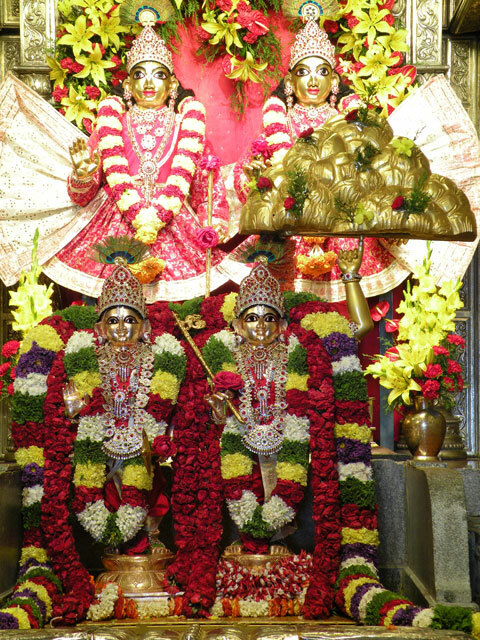 Deepotsava, the festival of lights which commemorates the pastime of Lord Krishna being bound by His mother Yashoda is celebrated in ISKCON Sri Radha Krishna Mandir starting from October 11, 2011 and will continue till November 9, 2011.